I came, I saw, I loved it! The wooden chariot with tiny flags, flowers and lights; Priests and their chants; The floating mass of people in high reverence, older generation with folded hands; Complete spirits of Lord Venkataramana; The gongs, cymbals, drums, conch, the lamps, flowers of variety; Aroma of authentic temple prasad food; Folks in their ostentatious finery; The visitors with their cameras; Such divinity in a ironical melody of a cacophonous crowd and I was witnessing the Kodial Teru for first time in my life. 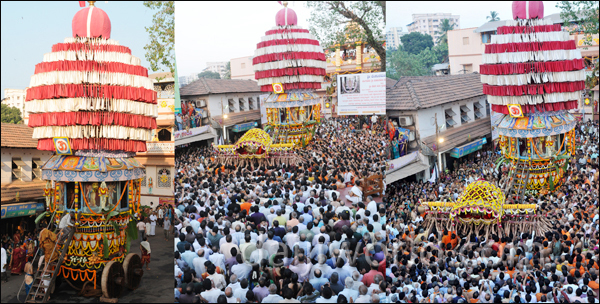 "Car festival/Rathothsav/Kodial Teru in konkani" the popular festival of the GSB (Gowda Saraswath Brahmins) community of Mangalore is about a week's festival, falling in mid or end January. Celebrated in the Car street premises of Shri Venkatesha Temple. 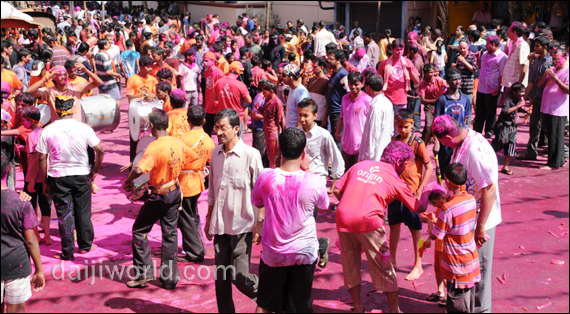 Mangalore is a multicultural potpourri of folks from all parts of India. Though not originally a GSB by origin I have been adopted by my husband and the community so well, I belong there now. A divine affair at the car festival has been my very first experience recently. Only to realize how the community folks flock from other side of hills for this festival. I've coined the term Times Square of our Mangalore. I could even call it Times Now square. The loud noises of drums and the sea of people there automatically makes every body an Arnab there! 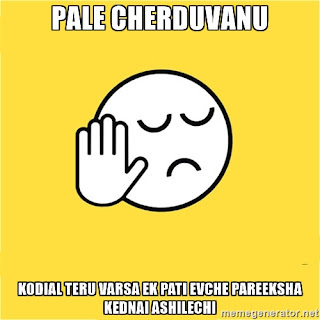 Car festival, is that time of the year when we ladies wait to show case the best of our finest yellow ornaments. How heavy are our ears, wrist and neck is how pretty we want to be. Fortunately the January weather cooperates with us as we drape ourselves in our 5 foot best silk saris and huff and puff in front of the mirror till we can faint. The men dressed in their best will be found walking around in the car street showcasing their fully charged battery performance. It's an absolute feast time for the sense organs. The genuine perfume of the jasmine flowers the women wear, can outdo the axe deodorant commercial made for men. The entire car street fills up your nostril till your lung with the exotic smell of chats, the sugar cane juice, the green mango pachadi (authentic mangalore salad), the churmuri and much more. The food stalls are the main attraction in the evening hours. Small vendors calling out to buy those lovely coloured balloons or colourful plastic toys make big dashing camouflage of a street. Chants, hymns and bhajans played in the stereophonic background makes the air more spiritual. A satisfaction of being my charitable element happened when a little girl came tugging my attire. Not only money but when I offered her food and few balloons, she soon returned with a big gang of hers. Serving each of them at the temple premises left me smiling thoroughly. The evening food in temple premises called Samradhana Jevan (Samradhana Food - Is the konkani term for the meal offered as Prasad) is where you get our statistics. And we hate our Prime minister for making us stand in queue in banks today. 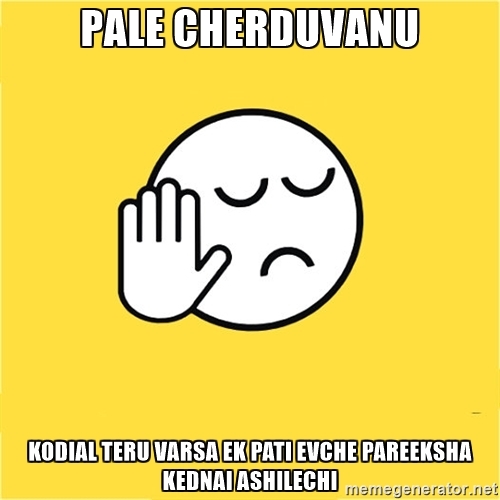 Trust me, we south Indians take pride in our finger licking etiquette, be it sambar or the sweet dish. I am completely convinced that eating with hands is integral to good eating. It heightens connection of sensory to food and has been scientifically proven too. Well, to know about the serious affair of this festival, on the first day the religious rituals marks a start with Morning Prarthana. The priests get busy with formalities and the people lend their hands in all possible arrangements. A flag is hoisted at the "Dhwaj Sthambh" marking the beginning of the festival. The next two morning proceedings conclude with the Utsav deity being worshiped in the palanquin. A series of Arti accompanied by vedic recitals, bhajan and Bhojan form the important part. "Hagalutsav" or the "morning utsav" signifies the fourth day proceeding. 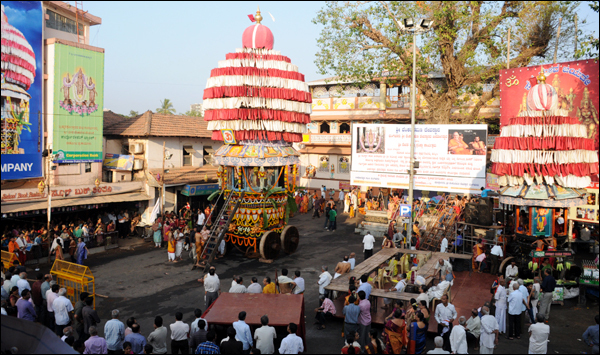 With the deity in the small chariot, a graceful procession is taken round the surrounding areas. "BrahmaRathotsav" the big car is completely set for the fifth day. Lord Venkatesha is decorated with jewels and fresh flowers, worshiped in the golden palanquin and later on moved on to the giant car which is rolled round by thousands of people shouting chants and praises of their beloved Lord. A scene much worth pausing and replaying if one could. "Splash of colours"! Yes, the concluding day holds a unique bust of energy from people of all ages who gather in the temple square premises for the much awaited "Okkuli". The Lord himself is first adorned with pink colour followed by sea of people in spirits of the same holi of colours. People play with colours and water the entire morning. Most local schools are announced closed for the festival on this day. Last day of the festival is again concluded by the flag hoisting as indication. The week's eat, pray, love and live marks an end. For most houses the kitchen officially opens full time from part time. The parking areas in surroundings suddenly seem wider and bigger. Roads will heave sigh off the beeline traffic. And one accumulates nostalgic memories as they wistfully await the next January. It is indeed a week of heavenly fun! Yes. It's unique experience. Have you been there? Many halls are created to provide a catering service to specific cultural needs. And it gets very difficult to have a party at a hotel because the catering staff could not cook the traditional meals required by the client. But this venue New York specialize in specific cultural needs.